What an amazing day of food, friends and fun. Oh gosh, where to begin. 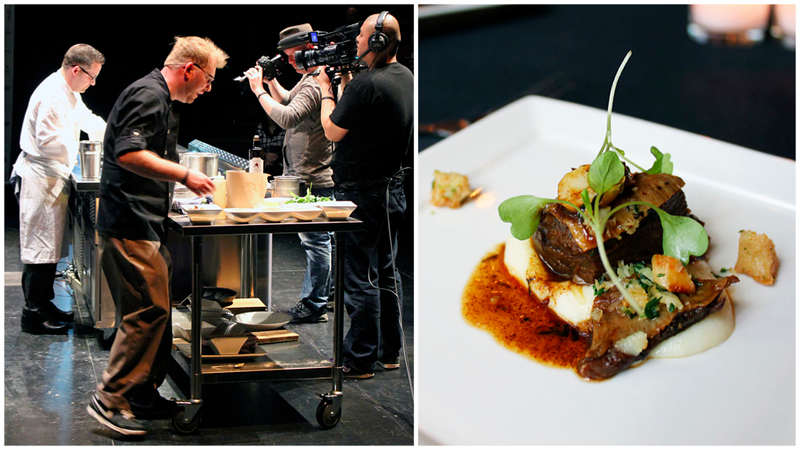 Well, as you know from previous blog posts, I was asked to be one of the official bloggers for the second-annual Celebrity Chefs of Canada event happening on March 25 at the National Arts Centre here in Ottawa. Since there are too many things that happened throughout the day for me to write any sort of cohesive blog post, I’m mostly going to post a few pictures with a short description underneath each of them. Hopefully that will help you get a snapshot of the day’s festivities. But wait! 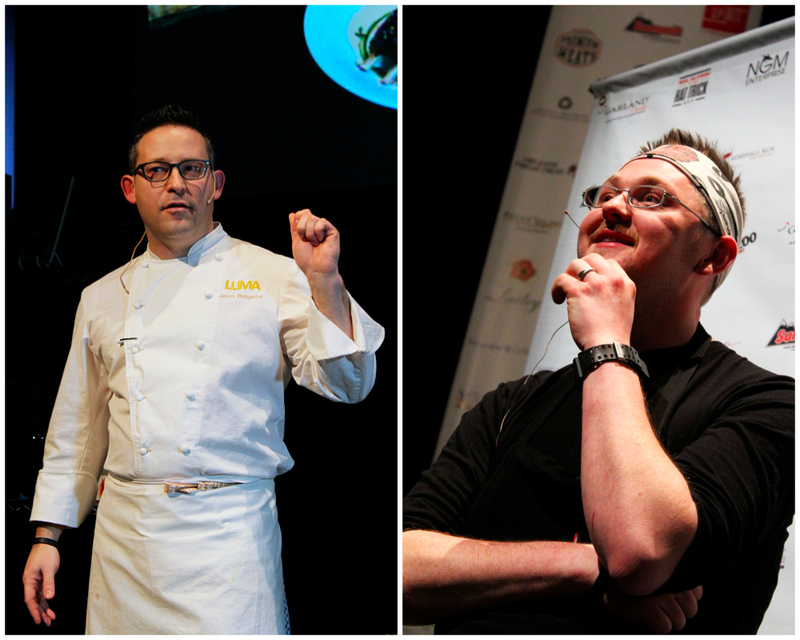 First, I’d like to give a HUGE shout-out to Chef Michael Blackie who did a tremendous job of organizing the entire day. Everything ran so smoothly and I thought the tasting reception after the demos was laid out well and satisfying. 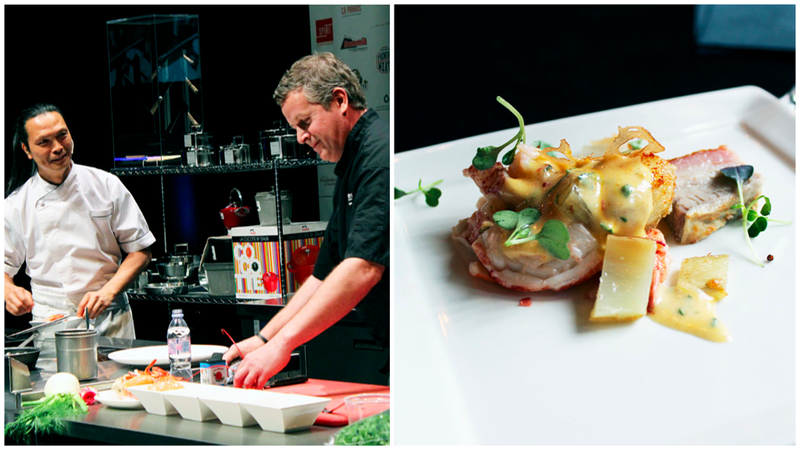 The first chef team up was Chef Marc Lepine of Atelier and Chef Quang Dang of West Restaurant in Vancouver. Since they were my team (rah rah!) I knew what to expect from their citrus marinated B.C. geoduck with Ocean emulsion dish. For those of you who have never seen a geoduck clam (which I’m guessing is pretty much everyone), it is a hilarious-looking piece of seafood that resembles a cross between a snuffaluffagus nose and a rather large male appendage. Here is a photo that someone posted on Twitter, just to illustrate. The impressive thing about this dish was that regardless of how many ingredients went into it (lots), you could still remarkably taste the flavours independently. I also really liked the pomelo ash and piece of beet paper jello that it was served with. Ah yes, the famous Chef Susur Lee! I think we were all in awe as this statuesque chef took the stage for his demo with Restaurant Ei8hteen’s Chef Matthew Carmichael. This was a really interesting chef pairing, I thought, since the two chefs used to work together. It was the reunion of the apprentice and the master. Their dish was a “chorizo style” St. Canut suckling pig, Parmesan crusted fennel and lobster salad with saffron mayonnaise. Get this – my first time ever trying lobster, it was prepared by one of the Ten Chefs of the Millennium. Will future lobster experiences ever be able to top that? Last but CERTAINLY not least was the braised elk ribs-cream polenta-tasty crispy bits dish that was created by Chef Jason Duffy of ARC Lounge and Chef Jason Bangerter of Luma in Toronto. This was definitely my favourite dish of the day. When it was presented after the demo session, the elk rib was sitting atop a long wooden plank – it was a beautiful serving method and looked rustic and warm. When I actually got around to tasting their creation, I could have died and gone to heaven. The elk meat melted off the bone and the crispy bits (as Chef Duffy said while serving the plate) were an essential part of the overall dish. It was so, so good. There were also some cool displays of magical kitchen mastery, and the scenes above made me feel like I was back in chemistry class. 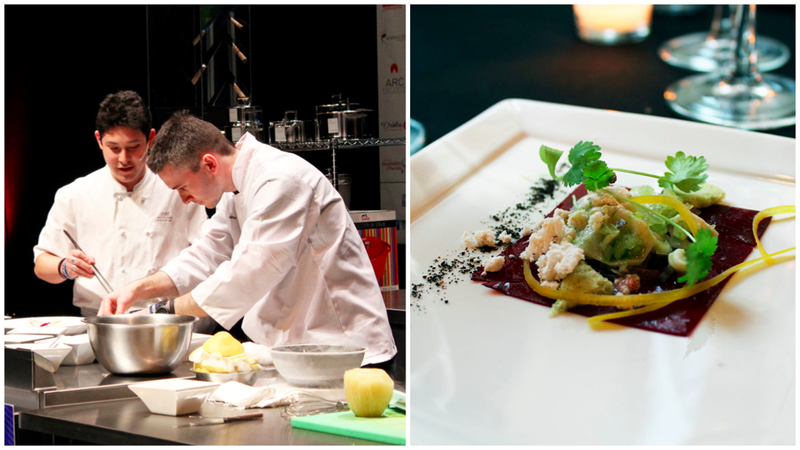 In the picture on the left, Chef Jason Parsons of Peller Estates Winery Restaurant in Niagara-on-the-Lake used what looked like a hookah to smoke the duck breast using peach essence. It smelled amazing. 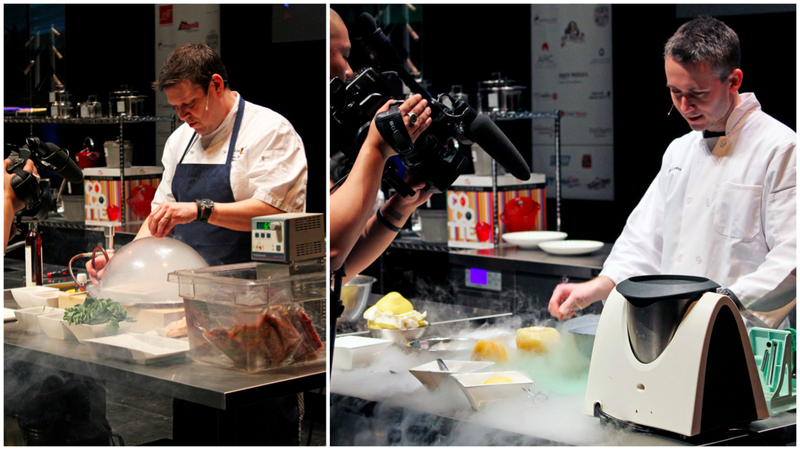 In the picture on the right, Chef Marc Lepine (king of kitchen gizmos and gadgets, not to mention molecular gastronomy), used liquid nitrogen to insta-freeze the pomelo. The cameramen loved filming that – anything with smoke makes for good footage. 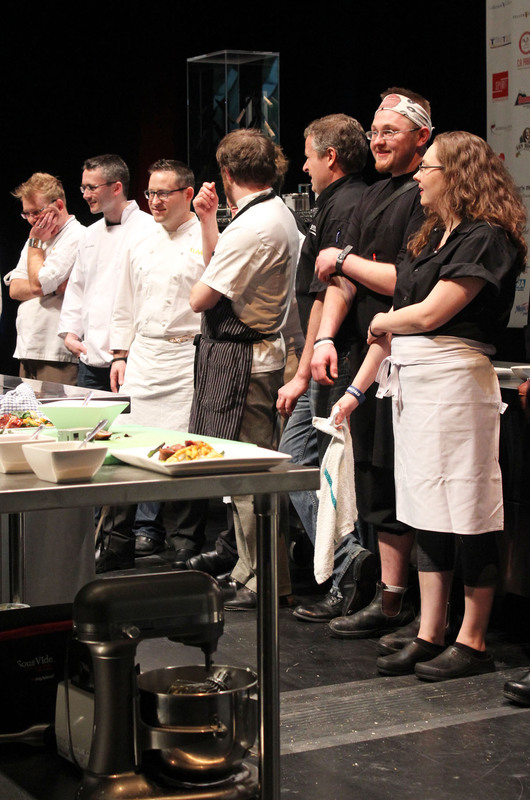 To end off, it was such a great opportunity to see all the chefs doing what they do best! They all came out at the end for the grand finale – here’s a few of them up at the front. I am SO happy I got to chance to go to this event, meet some great people and (of course) eat some beyond-delicious food. Happy stomach. I already wait in anticipation of next year’s event. I think I saw you at the event on Sunday night – I really like your article. I dont usually comment on food blogs as people might think I am being bias (given that I am chef Jonathan Korecki’s wife) but I think you did a great job here! Thank you so much for your comment and kind words! I hope you had as good a time on Sunday as I did. Please tell your husband that I’m rooting for him on Top Chef Canada!!! Go team go! That sounds like such a fantastic event to be a part of! Thank you so much for your great recap and photos. I love the comparison of the clam to a snufflufagus!